Beneath the overwrought presentation their settings sometimes entail, gaming’s most beloved action RPGs usually come with a good hook. A kind of “kick” to the experience that keeps you coming back for hours on end. These days, more often than not, that hook manifests as a statistical one: the eternal quest to find the best loot. Other times, a social or narrative hook is employed. When you care about the fictional characters or the real-players in a game, it’s easy to keep finding yourself drawn back to it. 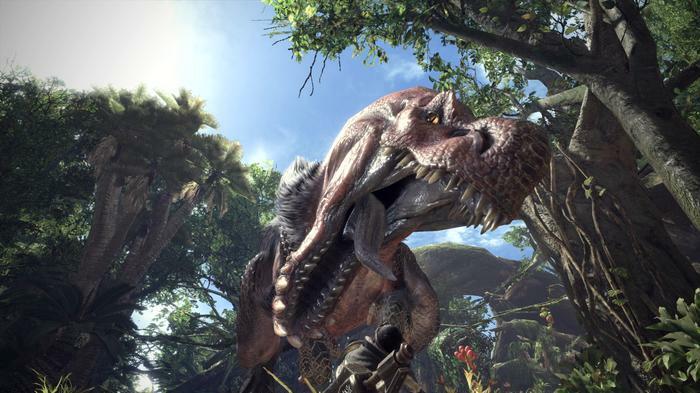 However, in the newly released Monster Hunter: World, things are a little different. This time, the hook isn’t anything to do loot, other people or exploration. In this instance, it’s a bit of a mix and it all comes down to the thrill of the hunt. Finding the biggest monster you can, then taking it down in single combat. As someone more familiar with the story-driven fare of companies like Bioware, the Monster Hunter series is one that I’ve always heard good things about - but struggled to ever connect with beyond a little dabbling with a demo of Monster Hunter Freedom on the PSP. I mean, I’m hardly opposed to a good ol’ fashioned monster hunt. I’ve been a fan of The Witcher since the series first made the jump across from Poland - but if that hunt is all there is, is it enough? 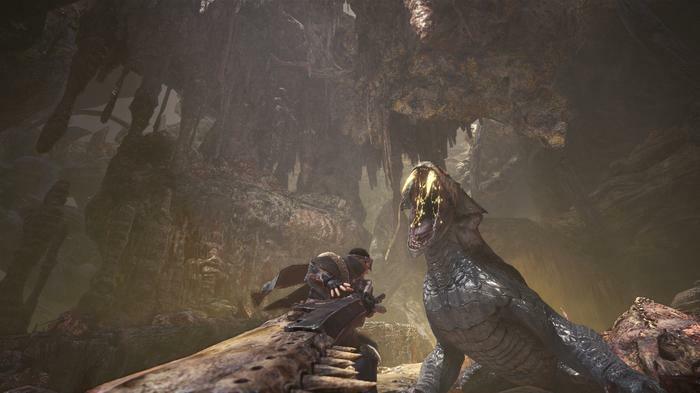 Assuming the role of a hunter sent as part of an expedition to uncharted wilderness of The New World, Monster Hunter: World sees you hunt exotic monsters, mine their corpses for materials, build better armor and more-powerful weapons and then hunt bigger and bigger monsters. 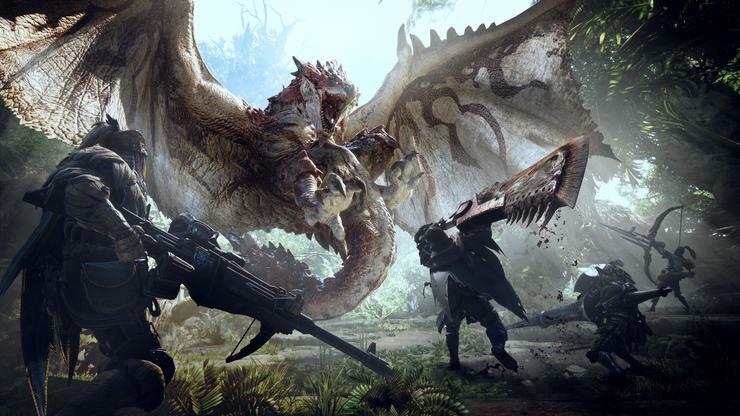 As reductive and bare-bones as that premise (and my own expectations for it) might sound, there actually was - surprisingly enough - a lot more of a narrative in Monster Hunter: World than I initially expected there to be. The game wastes no time introducing you to the different faces and personalities of The Fifth Fleet and as the hours roll on, it even spends a surprising amount of time and exposition teaching you more about the gargantuan, Godzilla-sized monster (otherwise known as Zorah Magdaros) whose migration to The New World acted as the catalyst for your expedition in the first place. After creating your character (via a pretty robust customization interface that will either matter to you “A LOT” or “NOT AT ALL”) you play through a short (but melodramatic) introductory sequence that helps familiarize you with the controls of the game. From there, it’s open season. Each of the game’s hunts will see you traipse across one of the game’s four large, open environs until you find some relevant trace of your quarry, then track them from there and eventually engage them in combat. Speaking of those environments, there are times when Monster Hunter: World looks pretty ordinary amongst the likes of hyper-detailed JRPG blockbusters like Final Fantasy XV. However, there are equally plenty of other moments where it’s absolutely jaw dropping in its own right. The use of lighting, sound and level design here comes together and results in a tone that perfectly matches the earnestness of the premise. Each of the games open worlds is a sprawling playground, filled with a literal ecosystem of flora and fauna that all interface with one another and as the hours tick by, the nuances of those interactions slowly seep to the fore. 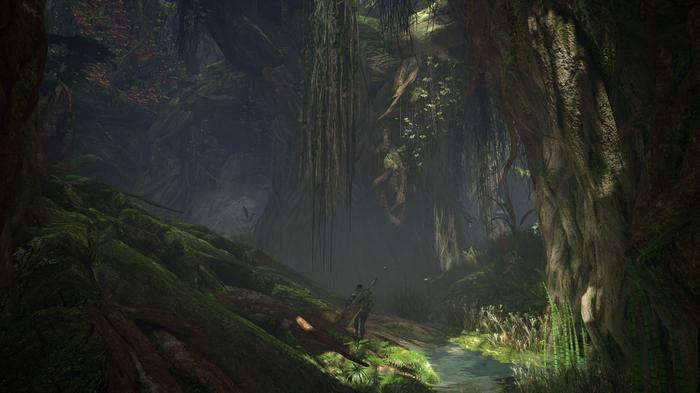 The game’s third environment - the Coral Forest - stands out as a particularly compelling example of this. The UI In Monster Hunter: World is a bit more of a mixed bag by comparison. Still, for the most-part, it manages to hit the mark of ‘good enough’ more frequently than its counterpart. That said, some of the interfaces for the crafting menus do end up feeling a lot more convoluted than they need to be and some of the text on the tutorial screens were so small I almost had to strain my eyes to read them. I can't speak to how these elements compare to the series' past installments but on this front, it does feel like some work still needs to be done. 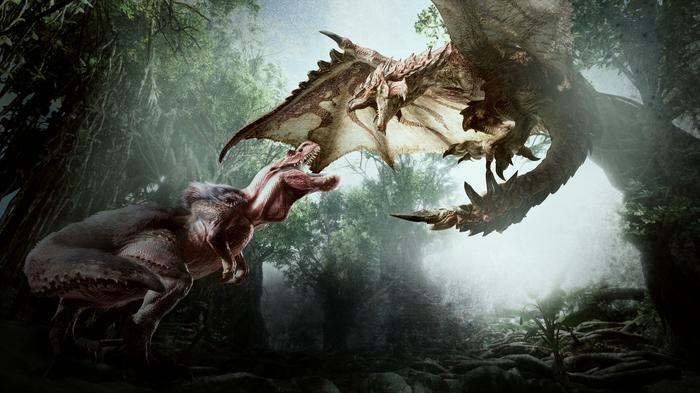 On the surface, the combat in Monster Hunter: World fairly straightforward. It definitely feels more approachable than what the series’ reputation had led me to expect. There are only a few combos for each weapon to remember. However, more-often-than-not, fights come down to your own preparation, focus and concentration more than they do any sort of stats on your weapons (though those do play a role). Over time, you get a sense of how each of the game’s colorful monsters fight. You learn when to dodge and when to retreat. Where to focus your attacks and how best to utilize the surrounding environment against your quarry. Battles are often prolonged affairs, with you chipping away at a monsters health until bit by bit. The game offers minimal indicators when it comes to the health of each monster - you don’t really know how long it takes to defeat them until you’ve tried. This element of mystery encourages you to play conservatively wherever possible and makes the taste of victory all that much sweeter. It’s not quite as punishing as something like Dark Souls, mind you. If you die, you’ll usually get another attempt or two before you fail the hunt. Still, once you’ve established the basics, the game opens up fast in terms of depth and detail. Perhaps more importantly, it manages to avoid overwhelming you in the process. Each monster is a problem, and you’re given a lot of freedom in the way you solve them. This is true from the first monster you hunt all the way to the last. There are dozens of different weapon types in the game - from bows to axes to lances to ‘Insect Glaives’ - but all are equally viable. It feels like players who want to learn and juggle a number of armaments are just as capable of besting the game’s menagerie of beasties as those who want to devote themselves to a single one. Between hunts, you’ll be able to explore the home base of the expedition and interact with its various members. 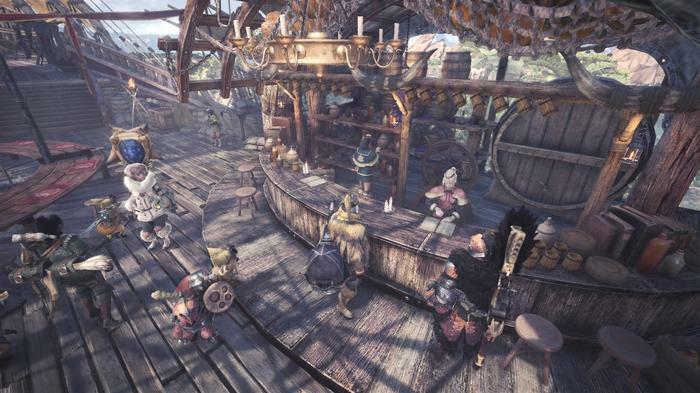 You’ll be able to craft new armor and items and even order food at the canteen - which bestows statistical bonuses on you before a hunt. You also get the chance to create and customize your Palico: a cat companion who will follow you around and fight alongside your side. This is a nice touch, and one that ensures that you have a fighting chance against some of the game’s more difficult beasts, even if you rarely engage with the cooperative online multiplayer (as I did). Monster Hunter: World has been designed as the series' most flexible yet in regards to multiplayer. If you want to put in the time, you can probably get through pretty much all the main story missions on your own. It might just take a little longer or require a little more grinding beforehand. Alternatively, you can fire off an SOS Flare whenever the going gets tough and be matched with other players attempting the same mission. The difficulty of the monsters scales accordingly. However, having multiple players and Palicos in the mix makes for a much easier time overall. In addition, I actually found that my Palico oddly added a lot of charm and character to a story that, while hitting some of the usual JRPG tropes pretty hard, often lacked in that area. My Palico would actively distract monsters in fights and, later, rally other critters to my aid when the chips were down. You can even craft special weapons and armor for them to improve and upgrade their combat capabilities. 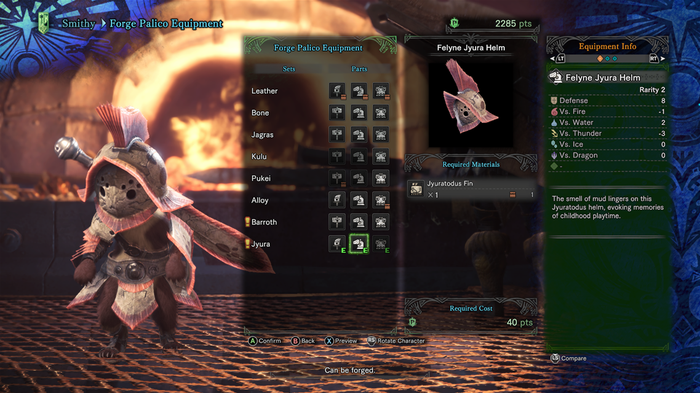 In fact, kitting out my Palico with increasingly ridiculous and adorable sets of armor was probably one of the most gleeful experiences I had with Monster Hunter: World. I mean, look at this little guy! Monster Hunter World sees the series make its most compelling case for itself yet. On a deeper, more-cerebral level, that case isn’t spectacularly different to what’s come before. Everything I’ve said about this game above, fans already know it. 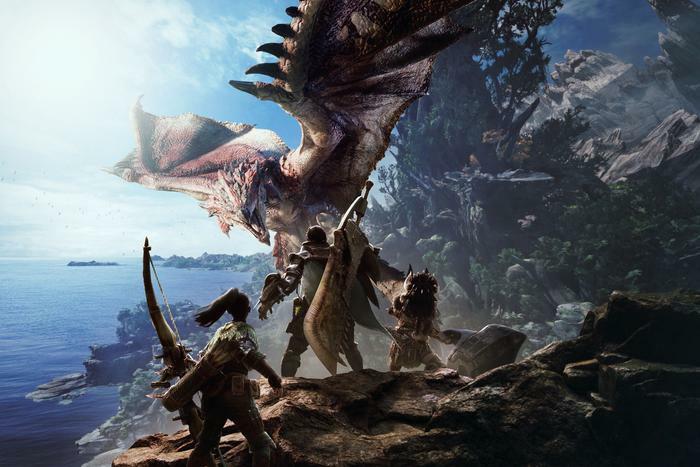 However, where it counts most, it feels like Monster Hunter: World makes the thrill of the hunt - the hook that’s drawn many to the series in the past - more accessible and visually-arresting than ever before. Despite having dabbled with the franchise in the past, this is the installment that managed to make me a believer. This is the one where I finally managed to find myself hooked by the thrill of the hunt.